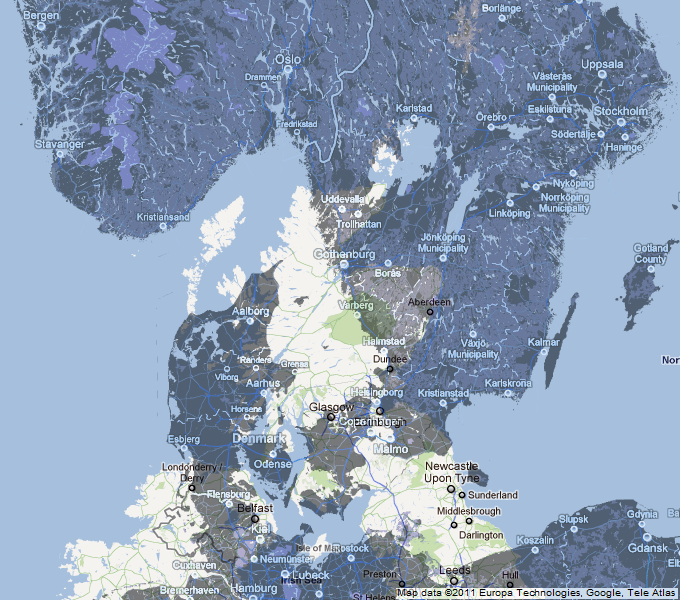 On a normal map it’s difficult to see how far north Scotland is compared to Scandinavia. To illustrate it better, I generated two Google maps of the same latitudes, just 15 degrees apart, and then superimposed them in the Gimp. You can see the result on the right (click on it for a larger version). It’s clear that all the cities of Scotland are on the same latitude as Denmark and southern Sweden, whereas only the far north of Scotland is as far north as southern Norway. Aberdeen is on a similar latitude as Aalborg or Varberg, Dundee is like Viborg, Glasgow is like Horsens, and the southernmost bit of Scotland is almost exactly as far south as Gedser in Denmark.